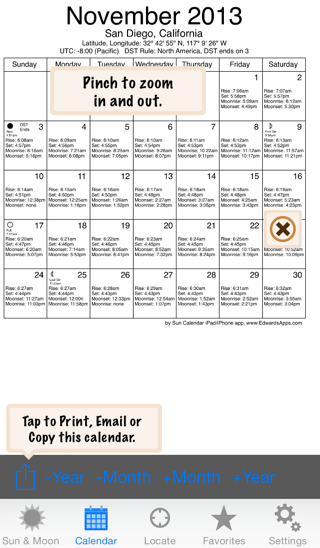 Email yourself the calendars, which are attached as PDFs. Print the PDFs from your laptop or desktop computer. If you have questions about using the app or its accuracy, PLEASE visit the app's page at www.EdwardsApps.com, the FAQs at www.SunriseSunset.com, or write me an email via the contact page on those sites. Original version 1.0.0, was released in November 2013. Click for full text of the help included in the current app. Minor updates for iOS 9. This release requires iOS 8.1. Added the ability to hide the Red Pin by tapping the minus button on the pin's annotation. Adjusted Mexican cities in the state of Quintana Roo, e.g. Cancún & Playa del Carmen. 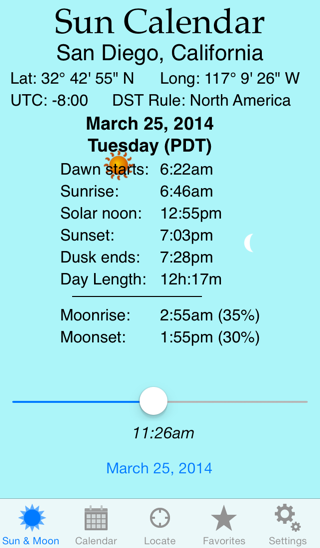 They now are in the Eastern time zone (-5:00) and do not observe DST (effective February 1, 2015). Added new time zone, KST (+8:30), for all of North Korea (effective August 16, 2015). Updated DST rules for Uruguay and Azerbaijan. Fixed searching for some U.S. states and Canadian provinces. Rewrote help, included new graphics and a section on iTunes File Sharing. 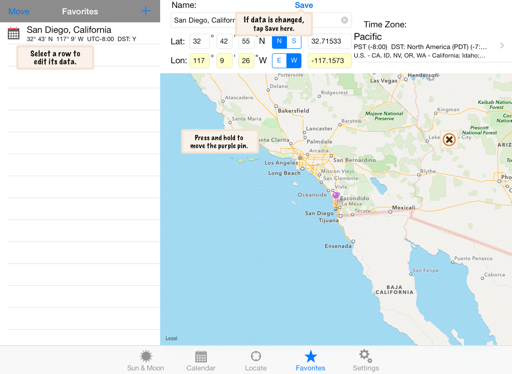 Search by city, town, state, province, country name on Locate screen. Can also search by zip or postal code, country code (i.e. za, at, can) or major airport codes (i.e. bru, lga, nrt). 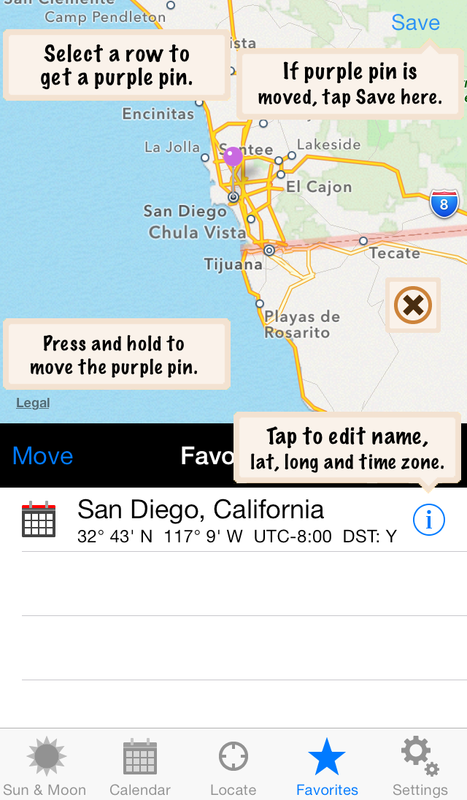 GPS on Locate screen, when on, will actively track your location. Tap the locate arrow to turn it on, tap again -- arrow will become hollow meaning GPS is off. Click "Bring Back Tutorial Guides" on Settings to see more info. Added support for Landscape orientation on all devices. 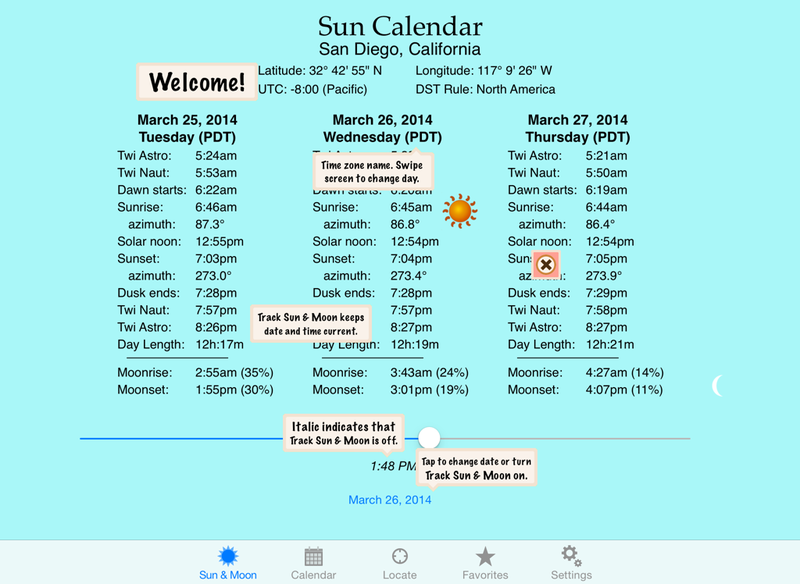 Updated DST rules for Chile. This update requires iOS 7.1. Next major release will require 8.0. Bug in versions 1.2.2 and earlier, September, 2016. When running on iOS 10, the app will be unable to save some changes to favorite data and will create an error log. This has been fixed in version 1.2.3. 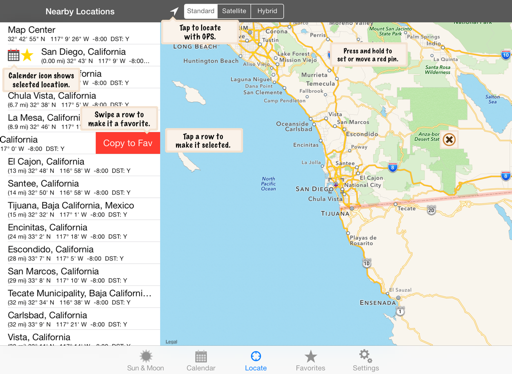 Bug in version 1.2, June 29, 2015. 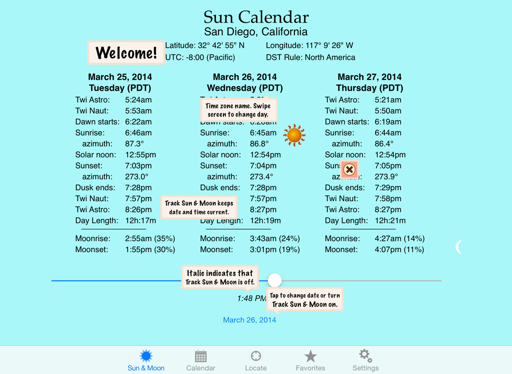 When the app is trying to make a larger font size on the Calendar, there is a problem calculating the size of the font for both Astronomical and Nautical Twilights. This can cause the app to hang. 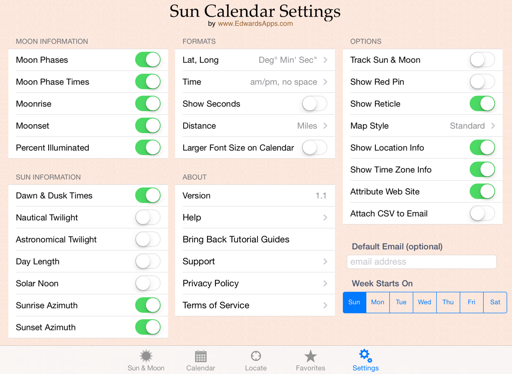 The workaround is to not select Larger Font Size on Calendar on the Settings screen when either Astronomical or Nautical Twilight is set to On. This has been fixed in version 1.2.1. Warning for iOS 8.3, April 16, 2015. When the app is trying to create a new location or changing the coordinates of some locations it will crash without saving. 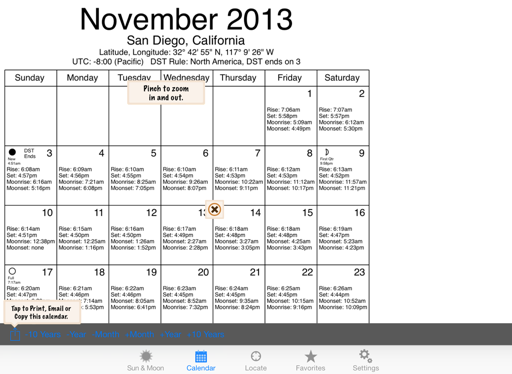 Earlier versions of iOS, 8.2 and lower, continue to work properly. 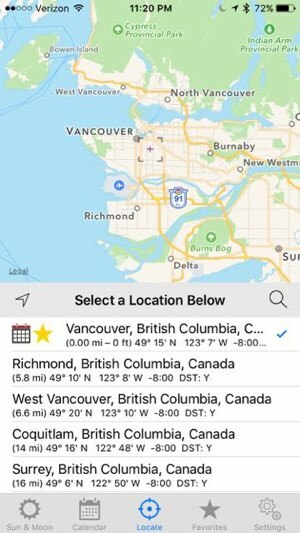 We are working on releasing a new version of the app, it will be a few weeks as we are also updating it for the iPhone 6 and 6 Plus. 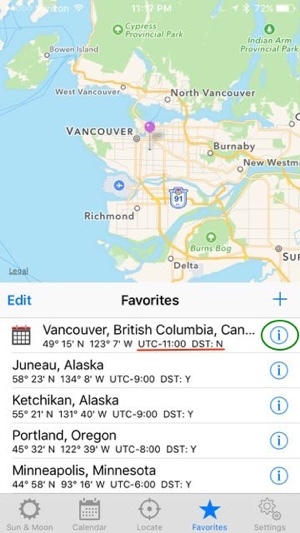 For now, the best workaround is to set a Red Pin (press and hold on the map on the Locate screen) and tap that line in the Nearby Locations table so the calendar and times get created for the Red Pin coordinates. This has been fixed in version 1.2 of the app. Why aren’t the earliest sunsets on the shortest day? 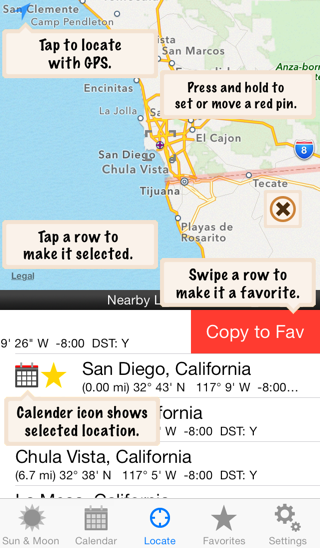 On the Favorites screen find the location that you need to fix. 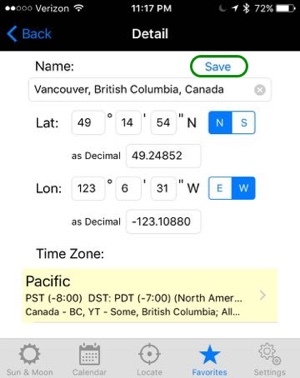 For this example, Vancouver has the incorrect time zone and the wrong DST rule. 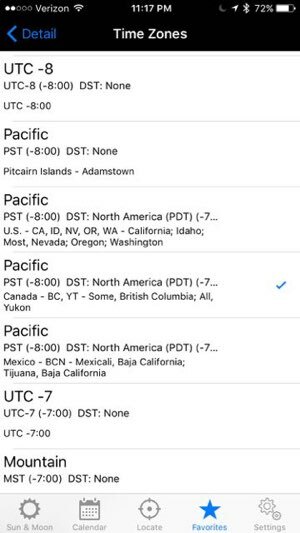 Vancouver is actually in the Pacific time zone (UTC -8:00) and uses the North America DST rules. Vancouver has the wrong time zone and DST rule (underlined in red). Tap the circled i (circled in green) to bring up the Detail screen. 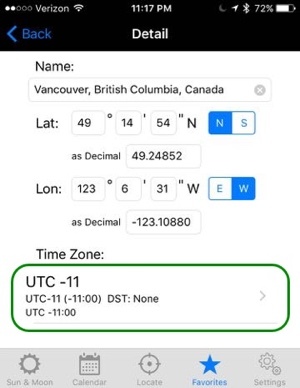 The Time Zone data is a button (circled in green). Tap the Time Zone button (circled in green). 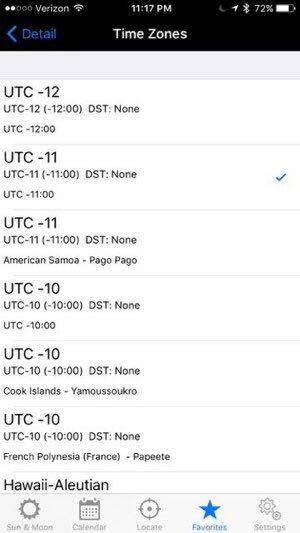 The time zone list with the wrong one selected. Click the "< Detail" button near the top to return to the Detail screen. Newly modified time zone data is highlighted in yellow. Save button is circled with green. Click the Save button (circled with green) and click the "< Back" button and go to the Locate screen. 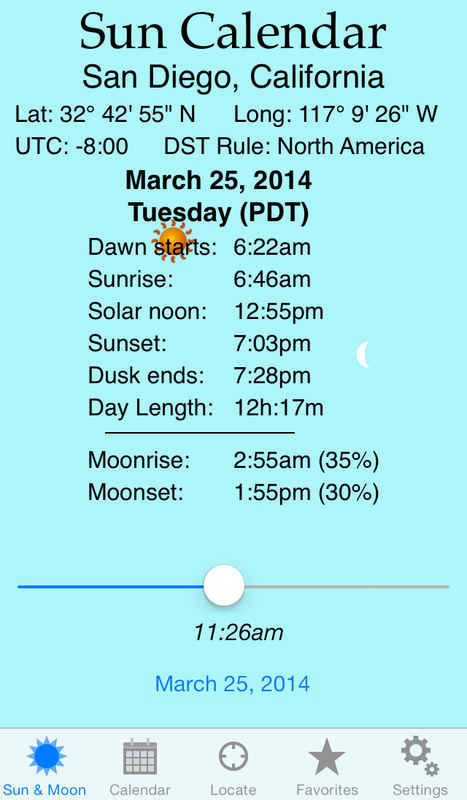 The location has now been corrected — all the screens in the app will use the new time zone and DST for that location. 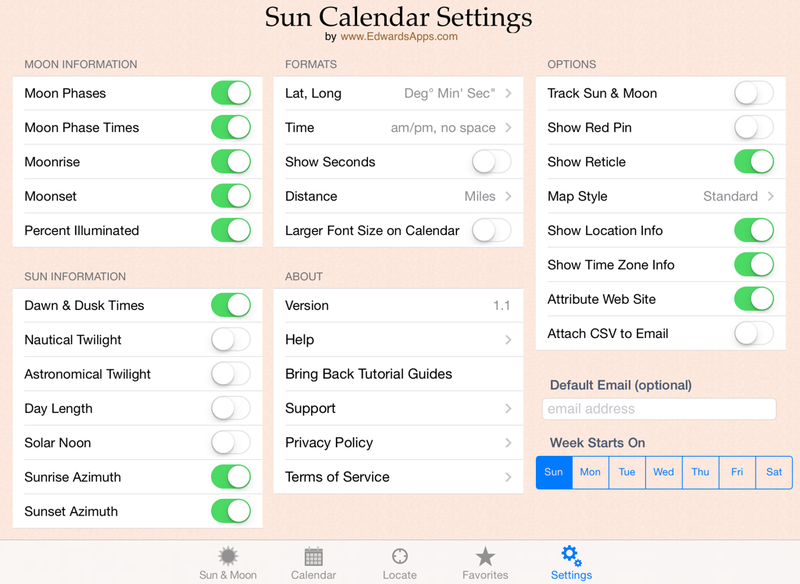 The Daylight Saving Time (DST) rules used by the app are the same as the SunriseSunset.com site. This page documents them. 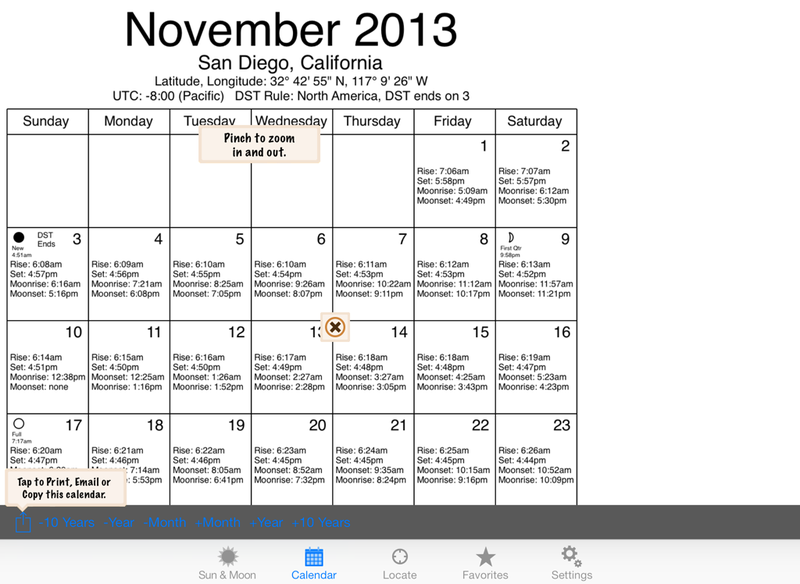 iPhone 4-inch images (all other sizes are also supported), see iPad images for the Settings screen, click to enlarge.